I think this image, seen in the sidebar of the main site, violates Twitter brand guidelines in that the site's logo is superimposed on Twitter's logo. 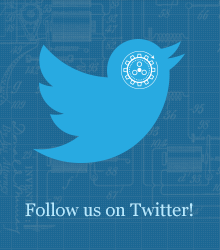 Do: Use our official, unmodified Twitter bird to represent our brand. Site Stats - design is broken, link isn't working and should Ask Patents even have them?